“Sky Life” is one of my most favorite stone sculptures. I love both the stones in this composition, and the dynamic pose of the swallow. I must often stop at a busy intersection near my studio, well-lit by massive streetlights in the evening. It is the corner of Taft and W. First Street for those of you familiar with Loveland. First St. is flanked by the Big Thompson River on one side and an irrigation canal on the other. Cottonwoods and willows line both waterways–the home of many bugs. Bright lights attract an abundance of flying insects, which, in turn, attract swallows for an evening meal. The cultural strata of this busy intersection is impressive, with cars and pedestrians below and many swooping birds above. The traffic light changes and I continue on, my mind filled with swooping and diving. I do know how to fly . . . As the Directing Animator on Zazu and Pegasus (from “The Lion King” and “Hercules” respectively) part of my responsibilities were to figure out how the characters moved, which included flying. I studied flying, reading about the aerodynamics of wings, the changes in pressure achieved through subtle feather movements, and studying birds in flight frame by frame. The first time I animated Zazu flying I wanted to feel his wings cupping the air and pushing down which brought his body up. Next rotating the wings to release the pressure and slice up on a diagonal in the upstroke, which brought his body slightly down. Then finally cupping more air pressing down on the next downstroke to complete the cycle. There is weight to the animation even in flight, which is obvious to an animator, and only felt by the audience. 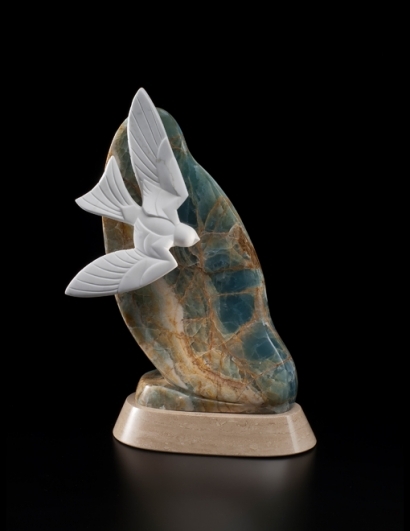 The two stones in this composition are Carrara Marble for the swallow and Blue Onyx for the sky. Both gorgeous! And, both used to their unique advantage. Carrara is expert at fine detail, breaking and bending light to describe the forms. Blue Onyx is superlative at being gorgeous. It is very tricky to carve, and simple forms work best with such an opulent stone.